Guanacaste is located in the northwestern region of Costa Rica and is famous for its beautiful beaches, surfing, national parks (such as Santa Rosa and Rincon de la Vieja) and exceptional weather. All this and more has attracted many foreign investors to the region. Living in Guanacaste puts all of Costa Rica's rich natural beauty at your doorstep. Costa Rica contains 5% of the world’s biodiversity, due in large part to its geographical position between North and South America - also known as the Isthmus of Panama. 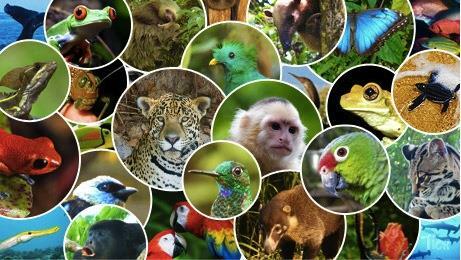 Costa Rica has an enormous volume of endemic species (species found nowhere else on the planet). While encompassing just one-third of a percent of the Earth’s landmass, about the size of West Virginia, Costa Rica’s biodiversity can be attributed to the variety of ecosystems within the country and the Atlantic and Pacific weather systems that come from both the east and the west coasts. Cloud forests, the Atlantic and Pacific coastlines, tropical rain forests, volcanoes, mangrove forests, dry tropical forests, deciduous forests all represent 19,730 square miles of Costa Rica’s landmass. There are 12 climatic zones in the country, each responsible for its own variation of biodiversity. 25% of the country has been designated as national park protected land, home to 12,000 species of plants, 1,239 species of butterflies, 838 species of birds, 440 species of reptiles and amphibians, and 232 species of mammals. Eco-tourism is a primary income source for Costa Rica, who takes a vested interest in the preservation and conservation of its natural biodiversity, mountains, wetlands, forests and coastlines. Guanacaste is full of treasures and exciting things to do. World-class scuba diving, snorkeling, boating, fishing, surfing, paddle boarding, swimming, hiking, bird watching, biking, zip-line canopy tours, mud baths, hot springs, white water rafting and the list goes on and on! Why is Guanacaste so desirable? Weather - The Gold Coast of Guanacaste has more days of sunshine and the least amount of rain than anywhere in the country. Warm, dry breezes from the Papagayo winds from December - March, where you won't feel a drop of rain. Ocean - This is one of the only areas in the country with tranquil calm bays, perfect for swimming, snorkeling, scuba diving, water sports, fishing, boating and marinas as there are no riptides or dangerous currents like other parts of the coast. For those that love surfing, Witches Rock, one of the top surf destinations in the world, is just a short boat ride away or Tamarindo about an hour drive south. Airport - The Daniel Oduber Airport has recently undergone an $18 M expansion (open January 2012) making it one of the most modern international airports in Central America. A short 20-minute drive to the beach town of Playa Hermosa makes it very convenient after a day of travel. Just a few minutes after you land, you can be enjoying a cocktail on your patio and watch the sunset over the Pacific Ocean. Excellent Hospitals and Health Care - There are two hospitals in the northern Guanacaste area. San Rafael Archangel located in Liberia is a private hospital and Dr. Enrigue Baltodano Briceno Public Hospital. There are many pivate docotos , dentist and clinics right in Playas Del Coco. Contact me today for more information on Guanacaste and the best places to live in this great area of Costa Rica.